Coordination of the scheduling practices that govern the flows of energy and payments for energy between the various control areas and transmission regions of the transmission grid. The second issue involves the scheduling practices required for reliable and safe use of various transmission facilities taking into account the charges for the use of the transmission facility that reflects the real costs of transmission facility use, making sure it is sufficient to pay for the maintenance, and provides appropriate incentives for the expansion of transmission facilities. It should also not over charge some facilities to pay for other transmission facilities within the grid. The issues involved are often called “seams” issues because while there may be alternative workable solutions in various regions of the grid, efficient operation of the entire grid requires coordination at the regional borders, or seams between the physical properties of the transmission grid, and the RTO’s grid operation protocols. The interaction of market rules and institutions with the physical properties of the grid may be simulated with sophisticated computer programs that include realistic representation of the behavior of market participants and can accurately model the physical transmission grid. These models can show the outcomes under an ideal set of market rules and institutions, which produce the least-cost mix of generation that is consistent with the physical requirements of grid operations. Alternative market rules can also be simulated, and the results are compared with the ideal outcome of the market models. 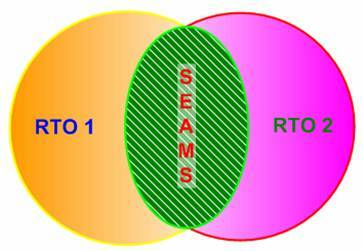 Such an approach allows objective evaluation of different proposed resolutions of seams issues. The UPLAN Network Power Model, developed by LCG Consulting, supports such simulation. It integrates a Nash model of profit-seeking generation owners with a state-of-the-art A/C Optimal Power Flow model, to allow simulation of both a minimum-cost security-constrained unit commitment and security-constrained economic dispatches. It also allows representing the most important seams issues related to sharing of regional resources for energy , reliability and transmission across the whole region. The use of such models is an essential part of diligent efforts to resolve the RTO seams issues and to optimize the operations of RTOs. Figure1. RTO 1 and RTO 2 and interregional coordination. To achieve the stated objective, UPLAN simultaneously optimizes the operation of all the RTOs within the grid by modeling the interconnected region while maintaining the individual operation protocol of each RTO and accurately representing the Seams protocol of interactions amongst the RTOs. In practical terms, the representation of inter-regional issues mainly involves the modeling of exports/imports, network constraint, inter- and intra-regional congestion management, and operation of phase shifters under alternative transmission tariff arrangements. Focusing attention on any particular RTO while ignoring or reducing the impact of other RTOs severely misestimates the inter-regional issues such as import/export profile, sharing of ancillary services and reserve, as well as operation of hydro generators. Attempts to model RTOs in isolation with minimum surrounding network interaction have not produced desirable results.